This shirt has us dreaming of the coast. The Lakepointe Printed Seersucker Casual Shirt is a white, seersucker shirt with a watercolor seagull print. Constructed from lightweight, 100% cotton seersucker fabric. Features the Ledbury Spread collar and double-barrel cuffs with reinforced buttons. Available in Tailored and Classic fits. 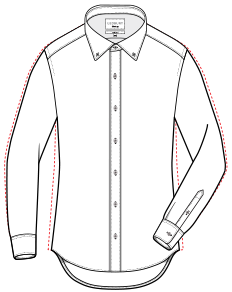 Collar: Spread collar; finished with a canvassed interlining to prevent unwanted folding and collar collapse. Gentle machine wash or hand wash in cold water. Hang or lay flat to dry, as machine drying can cause shrinkage. Remove collar stays before laundering. Avoid excessive heat and use little to no starch to prolong the life of the shirt. This lightweight seersucker has a watercolor-inspired seagull print sure to turn heads. Professional style curator Noah Williams shows us how it’s done with a fun summer print.